Exotic pets like parrots have become the rage even though they are challenging to keep in captivity. Large-scale "parrot mill" breeding operations, which supply popular warehouse pet store chains are producing thousands of potentially very long-lived parrot chicks each year to keep up with the demand for babies. Raising parrots under such ‘assembly line,” high-production breeding conditions often compromise a bird’s physical and social needs. To make matters worse, when these birds are sold through warehouse pet stores, buyers rarely receive quality products or solid advice from an inexperienced staff. In addition, the display of gentle, adorable, juvenile birds in these stores leads to many being purchased on impulse — and a parrot purchased on impulse without serious preparation and education rarely finds a lifelong home. Unfortunately, the public is still largely uneducated about the real challenges of keeping parrots in captivity. Many adolescent and adult parrots lose their homes when their "true colors" as wild animals start to shine. Thousands of birds are displaced each year because neither these birds nor their buyers are properly prepared for success. The least fortunate birds are passed from home to home before dying from neglect or abuse, or they are euthanized. The lucky ones end up in adoption shelters or sanctuaries, which are now filling up fast! You can help solve this problem by not breeding birds and by adopting a displaced bird rather than buying one from a pet store or breeder — but only if you are ready to make a lifetime care commitment. 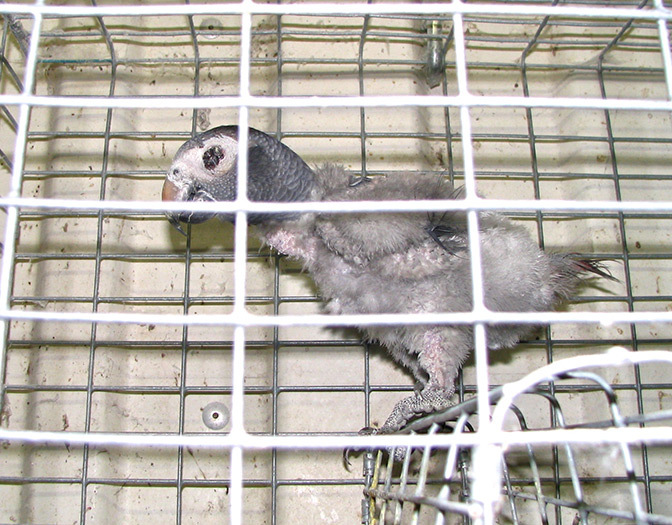 There are many birds in captivity who cannot be returned to the wild and need our care. Legal protections defining neglect, substandard care, and abuse for captive birds are sorely lacking. Denied Their Natural Habits, Millions of Pet Parrots Lead Bleak, Lonely Lives.